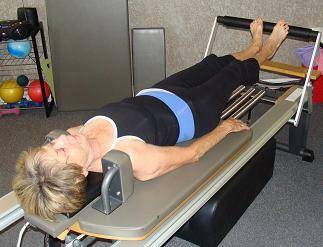 Some of the best lower body exercises for knee joint pain can be done on the Pilates Reformer. Check out my knee pain exercise workout on YouTube! The knee is one of 187 joints in the body and it is also the most vulnerable joint in the body. The knees have to carry us around all day! Imagine how tired and sore you'd feel having to carry "YOU" around all day. Although the knee is one of the most prominent and largest joints in the body it is also the most unstable and complicated. Because we are such an active society and like to do things such as skiing, jumping, jogging, skating, tennis, golf, and other high impact and joint stressful exercises, we are bound to suffer pain and injuries to the knee joint. I know...I have been through 3 knee surgeries myself! Women are more susceptible to injuring having sore knees due to our anatomical structure. The best exercises for knee joint pain is to do exercises that do not aggravate and cause more pain. 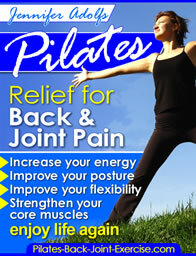 That is why Pilates exercises have been so beneficial to strengthening my own and my students knees. Pilates Footwork on the reformer shown to the right here helps to recalibrate the length tension imbalances in the legs by stretching the tight muscles and strengthening the weak ones. The spring tension on the Pilates machines is very gentle on the joints and I have had great success with my students in pre and post rehab on sore and arthritic knees. If you are overweight it is very important to begin with non-weight bearing exercises to stop the aggravation. Swimming and bicycling are great ways to begin losing weight without putting extra strain on the knee joint. Water workouts are a great way to exercise knee pain away because you get the resistance medium from the water, which concurrently works opposing muscle groups without the weight bearing effects on the joint. Check out the aquatic arthritis exercise program here. Water running and regular swimming are very effective at strengthening both the muscles surrounding the joints, as well as improving your cardiovascular conditioning. 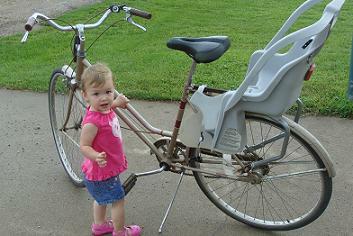 I began doing my rehabilitation exercises for my sore knees after surgery by bicycling. It is one of the best overall knee pain exercise because you not only strengthen the musculature around the knee, but it is also a great range of motion exercise getting the tendons and ligaments around the joint stretched out again. You may feel muscle soreness after your workout but you should not feel pain when you attempt to exercise knee pain away. If you are having an increase in pain and swelling after your workouts you need to cut back a bit the next time to relieve knee pain. If you experience pain around your kneecap during weightlifting your weights are too heavy! Only increase the resistance load after you are comfortable at a particular level of knee pain exercise for 3 sessions. Avoid doing any deep knee bend exercises for knee joint pain! It has been 10 years following my surgeries and I am now using Pilates and ball exercises to keep strengthening the muscles that surround and protect my knees. I have not had any more injuries and am finally seeing a balance in the muscles between the affected and unaffected knee. See more exercises and detailed descriptions to strengthen your core and exercises for knee joint pain in the new Pilates ebook available here.